Displaying an alert or asking a user to make a choice is a common UI task. 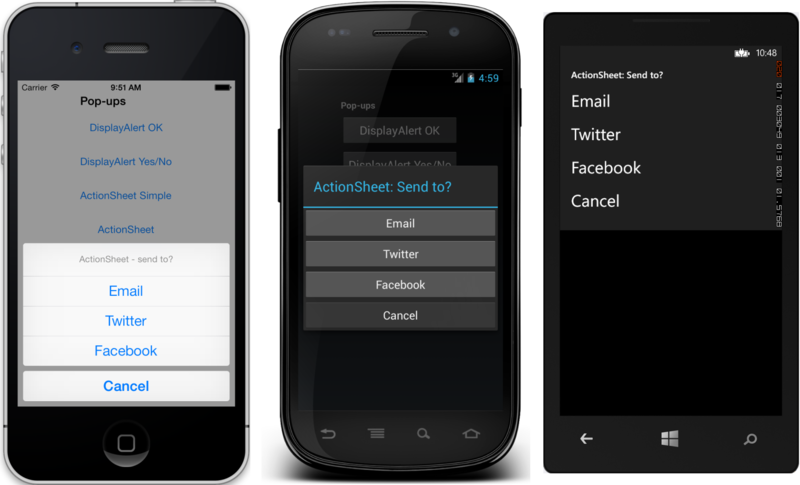 Xamarin.Forms has two methods on the Page class for interacting with the user via a pop-up: DisplayAlert and DisplayActionSheet. Prism provides a single IPageDialogService that abstracts away the Xamarin.Forms Page object dependency required for these actions and keeps your ViewModels clean and testable. Simply request this service via the constructor of your ViewModel, and call either the DisplayAlert, or DisplayActionSheet to invoke the desired notification. This example does not collect information from the user. 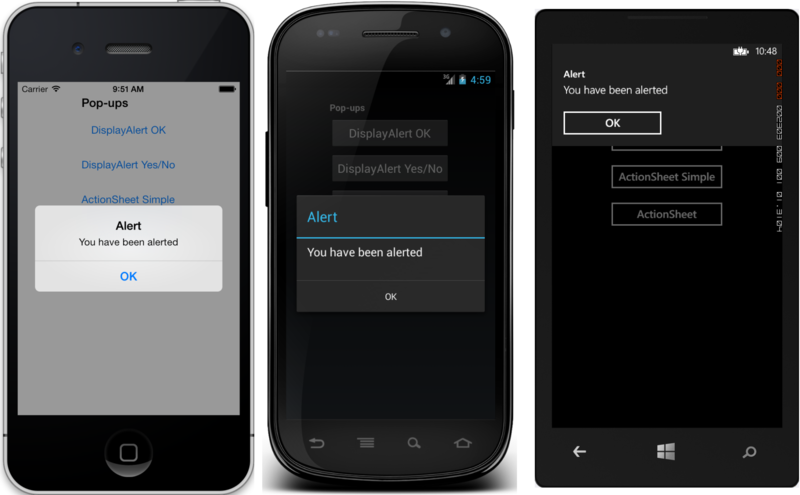 The alert displays modally and once dismissed the user continues interacting with the application. DisplayAlertAsync can also be used to capture a user's response by presenting two buttons and returning a boolean. The UIActionSheet is a common UI element in iOS. The IPageDialogService.DisplayActionSheetAsync lets you include this control in cross-platforms apps, rendering native alternatives in Android and Windows Phone. Additionally, Prism provides another option which accepts an array of IActionSheetButton that allow you to specificy the title of the buttons, as well as the DelegateCommand that should be executed when the option is selected by the user. This eliminates the need to capture a string result, perform a logical check against the result, and then execute a method or logic in response. To create an IActionSheetButton, use one of the three factory methods off of the ActionSheetButton class. Note: The order in which you pass in the IActionSheetButton parameters does not matter. The IPageDialogService will make sure the parameters are handled properly for you.